In skimming the pages of any cultural history, one is bound to find some similarities among various peoples—for instance, the desire to be clean and sweet-smelling, coupled with the yen to be handsome or beautiful. Come along as we catch some glimpses of beauty treatments and personal hygiene—ancient Near East style. Picture yourself in a home in some ancient village, looking into a lovely hand-woven basket. It contains an odd assortment to your eye. What do you suppose its contents are used for? If you answer that people from the ancient Near East use these in the act of personal bathing, you are correct. Cleanliness is a basic priority for many cultures, and particularly, among both Old and New Testament Israelites. It is especially imperative for them to be clean in preparation for the Sabbath. Ashes of soda-yielding plants mixed with some kind of fat are used for washing one’s body. If a laborer (like a tanner) is especially dirty, he can use a pumice-stone as an abrasive, or natron (from the same root word which means “to froth”), the sodium carbonate imported from Egypt or Syria, to remove the grime. He might finish off by rubbing himself with the strongly scented herbs of rosemary and marjoram. After women (and perhaps some men) bathe themselves, they apply creams to protect their skin against the harsh sun, and to counteract body odors. These emollients consist of oils from olives, almonds, gourds, various trees and plants, and animals or fish. Adding fragrances produced by expert craftsmen from “seeds, plant leaves, fruits, and flowers, especially roses, jasmines, mints, balsams, and cinnamon” makes this beauty treatment especially luxurious. Peering at the contents more closely, you spy a small jar of what appears to be a finely ground spice. Is it pepper? With a quick sniff you recognize it immediately—it’s licorice or anise. Do you wonder why this is included? Toothbrushes or toothpaste have yet to be invented. The ancient Egyptians’ formula for dental hygiene consisted of powdered ashes of ox hooves, myrrh, powdered and burnt eggshells, and pumice. 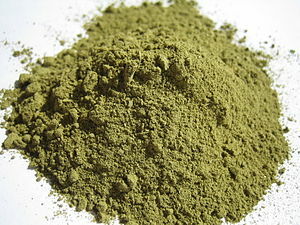 Over time, the peppery anise powder comes to be used as a breath freshener. The Romans will soon step in with more refinements, adding abrasives such as crushed bones and oyster shells, to aid in cleaning debris from teeth. They also add powdered charcoal, powdered bark and more flavoring agents to improve the breath. The “toothbrush” remains the same—one’s finger. (It is believed that the Chinese invented the toothbrush in 1498, using bristles from pig’s necks). Henri Daniel-Rops shares Josephus’ eye-witness commentary concerning some hair treatments of the day: “Depraved young men would sprinkle it [their hair] with gold dust to make it more brilliant,” and, “old bucks like Herod dyed it.”  In Jezebel’s time it was usual for women to cover their grey using Antioch-red or Alexandrian henna (p. 304). That custom found its way to the first century as well. “Both men and women dyed their hair. Men sometimes dyed it black, sometimes blonde. Women dyed their hair black, but especially auburn, and were at pains to cover grey hair.” Wigs were also worn by both sexes, although this style existed in the main within the ranks of the wealthy non-Jewish upper-class. Hair styles have been of significant importance to women (and men) throughout history. They not only enhance beauty but they say much about a woman’s social standing within her community. Cultural historians note that first century hair styles included plaiting: “The women of Israel were very cleaver at plaiting their hair, adorning it and even curling it” (Daniel-Rops, page 304). Young women sometimes tied their hair back in a plain knot, and then ran a plait over the top of the head in the front. 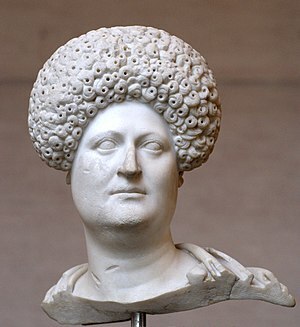 Roman women of the upper class often piled their hair high in elaborate styles. Bouquet writes, “Towards the end of the first century most wonderful structures came to be erected on the top of women’s heads” (p. 68). While some things never seem change—i.e., the desire for beauty and cleanliness—regarding certain others, there is no comparison between then and now. I, for one, am quite happy with bars of soap manufactured to meet my skin’s particular needs, minty toothpaste applied on soft-bristled brushes, shampoos that clean, rinse out easily, and leave hair with a healthy shine, and, private baths. I don’t mind glimpsing the past, but I surely wouldn’t want to stay there. Daily Life in the Time of Jesus, Henri Daniel-Rops (1961), p. 302. Everyday Life in New Testament Times, A.C. Bouquet (1953), p. 67. Posted in Bathing, Hair, Henna, Hygiene, Roman woman, Toothpaste, Uncategorized. Bookmark the permalink. Spot on with this write-up, I really think this site needs a lot more attention. I’ll probably be back again to see more, thanks for the information! We are happy that you find our blog helpful, and we hope you’ll visit us often in the future. Hi, I do believe this is a great blog. I stumbledupon it 😉 I will revisit yet again since i have book marked it. Money and freedom is the greatest way to change, may you be rich and continue to help other people. Spot on with this write-up, I seriously believe that this site needs far more attention. I’ll probably be back again to read through more, thanks for the advice! After going over a number of the blog articles on your blog, I honestly appreciate your way of writing a blog. I book-marked it to my bookmark website list and will be checking back in the near future. Please visit my web site too and tell me how you feel. Thank you so much for your kind comments. Your website looks intriguing, and I look forward to exploring it more fully! Your mode of describing the whole thing in this post is truly nice, all be able to simply be aware of it, Thanks a lot. Hello, and thank you for your comment. We’re glad you found our site enjoyable. With havin so much content do you ever run into any problems of plagorism or copyright violation? My website has a lot of unique content I’ve either written myself or outsourced but it looks like a lot of it is popping it up all over the internet without my agreement. Do you know any techniques to help prevent content from being ripped off? I’d truly appreciate it. I sent my response by private email. Thank you for visiting our blog.